Dec 16, 2016 (LBO) – Sri Lanka has been selected for the US Millennium Challenge Corporation’s (MCC) new five-year grant compact which aims at encouraging economic growth and reduce poverty. At its quarterly meeting on December 13, 2016, the MCC’s Board of Directors selected Sri Lanka, Burkina Faso and Tunisia for these new MCC compacts, US Embassy in Colombo said. “MCC’s considerable support is a major boost to our six decades of development partnership with the people of Sri Lanka,” US Ambassador to Sri Lanka Atul Keshap said. 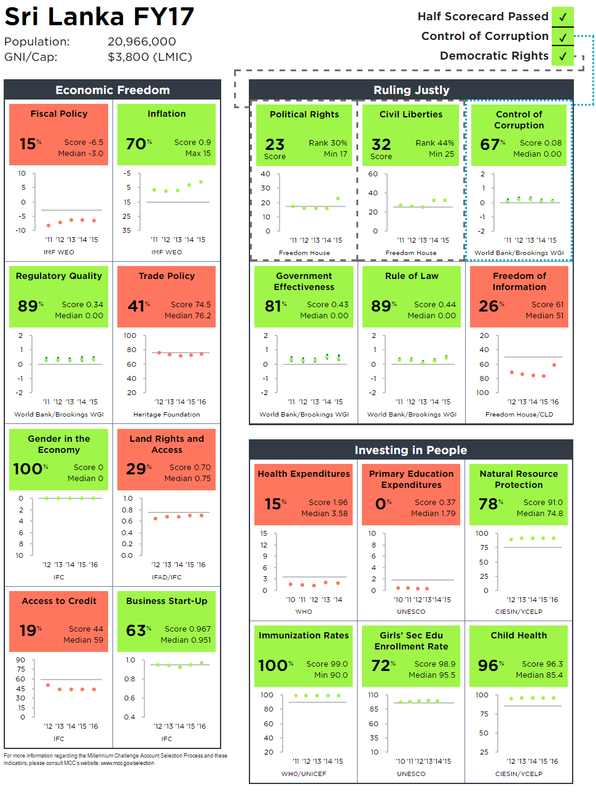 For a country to be selected as eligible for MCC assistance, it must demonstrate a commitment to just and democratic governance, investments in its people, and economic freedom, as measured by third-party policy indicators on MCC’s annual scorecard. “By partnering with developing countries that meet rigorous standards for good governance, from fighting corruption to respecting the rights of women and the rule of law, we are maximizing our ability to fight poverty and transform people’s lives,” MCC Chief Executive Officer Dana J. Hyde said. Sri Lanka, which was selected in December 2015 for a threshold program, will now transition into the compact program after showing continued improvement on its scorecard, including demonstrated progress on democratic rights. Tunisia is also new compact partner for MCC, while Burkina Faso successfully completed its first MCC compact in July 2014 and has demonstrated clear policy improvement on its scorecard since the election of its new government in 2015. In both Sri Lanka and Burkina Faso, the Board recommended that MCC explore investments that address obstacles to economic growth – both domestic and regional – while recognizing the need for statutory authority to optimize regional impact.